PokÃ©monÂ games don’t have a good history on home consoles. The bulk of the titles have either been glorified apps for viewing and battling the PokÃ©monÂ from your portable games (PokÃ©mon Stadium, PokÃ©monÂ Battle Revolution) or weirdly gimped RPG experiences (PokÃ©monÂ Colosseum, PokÃ©monÂ XD: Gale of Darkness). Game Freak and Nintendo have each previously voiced their opinions that core PokÃ©monÂ RPGs are best experienced on portable game systems, owing to the nature of collecting, grinding and trading. This is why every core PokÃ©mon experience to date, plus the recently announced PokÃ©mon X and PokÃ©mon Y, are strictly bound to GameBoys and DS systems. But perhaps the Wii U, Nintendo’s most connected and most social home console to date, could influence that to change. Let’s take a look at how the system’s unique and innovative features might influence the gameplay of a ‘PokÃ©mon Wii U’, were it to be aÂ traditional PokÃ©monÂ RPG. We’ve recently been given a look at what the interior of a PokÃ©monÂ centre might look like on an HD system (although it’s not the art style I would have gone for), but how would the centre operate? Given the advanced social capabilities of the Wii U one could speculate that theÂ PokÃ©mon centre, long the home of the portable games’ connectivity functions, might operate as a new game’s trading, battling and social hub. Of course the Wii U is always online and always connected to your friends, so it would no longer strictly be necessary to play at the same time or in the same space to enjoy the full benefits of connectivity. Being online at the exact same time as your buddy might allow you to battle or trade directly, or team up to take on all online comers in a two-on-two tournament, but even if none of your friends were online there could be plenty of asynchronous online features. Perhaps you could access your friend’s trainer card, see what PokÃ©monÂ and items she currently has, and propose a trade. Your friend would get a Wii U notification and the next time she’s online she would have the option of accepting, rejecting or modifying your offer. To get a little more speculative, perhaps an online PokÃ©monÂ centre would allow the removal of previous games’ automated daycare and breeding services in favour of social versions of the same systems. 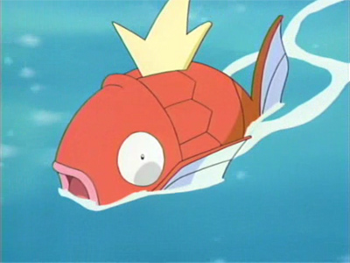 For example you have a level 4 Magikarp and want to level him up in order to evolve into Gyarados. Take him to the daycare centre, right? But what if you could find a real-life player through the PokÃ©monÂ centre who you would pay per level to take your Magikarp around the region with them gaining experience? That way players who love to grind would be rewarded for their services, and you’d get a levelled upÂ PokÃ©monÂ and a cool social experience. Since the first DS PokÃ©monÂ RPGs the virtues of a dual-screen device for batling have been clear. Big, touchscreen buttons streamline the experience of selecting moves and items while freeing up real estate on the main screen for health bars and of course the PokÃ©monÂ themselves. This same two-screen setup could be brought over to Wii U wholesale thanks to the gamepad, and the whole dynamic could even be improved upon for the home console. The large size of the gamepad screen means the battle commands needn’t take up the whole thing, and would likely function just fine if confined to one half of the display. The other half could be used for vital battle statistics or other information. Perhaps that side of the screen could even be devoted to displaying information from equippable apps or gear, the like of which we’ve seen in past games, which serve specific battle functions. One app might be a reactive and interactive PokÃ©dex, analysing the strength of your team of monsters against your opponent’s on the fly. Another might be as simple as stats on the number and type of different moves used, or a detailed chart on the progress of your team toward levelling and evolution. There whole game could also feature a single-screen option that incorporated contextual menu overlays onto the main screen, like in the GameBoy Advance games, in case you wanted to play the game solely on your TV with a pro controller or solely on the gamepad while your significant other watches MacGuyver. The gamepad has exciting potential in terms of augmenting the experience of wandering around looking for battles and wild PokÃ©monÂ too, as that same technique of using half the screen for game commands and half for customisable apps could be instituted to provide a range of different services. Remember the PokÃ©tchÂ watch in Diamond / Pearl? The simple LCD wristwatch provided many different apps to play with, from a representation of your team’s health to a radar that displayed hidden items. That functionality could be expanded on Wii U to far beyond even what the 3DS will be capable of in X/Y. Perhaps a dynamic RSS-style feed of what your online friends are doing, which PokÃ©monÂ they have caught recently or who they are challenging. Regardless of the exact use of the touchscreen, it’s at least clear that a Wii U PokÃ©monÂ RPG would allow you to rifle through your bag and check on your stored PokÃ©monÂ on the gamepad without ever having to pause the action on the main screen. After a battle potions and status items could be administered, PokÃ©monÂ could be switched in and out in a matter of seconds. This simple fact could speed up the minute-to-minute gameplay considerably. And what of the broadened internet functionality of Wii U? Perhaps a Wii U PokÃ©monÂ RPG could feature something like the safari seen in previous games, updated to allow you to explore an enclosed environment with a group of online friends. Allowing peer-to-peer interaction in the general game would be difficult without changing the whole dynamic of the RPG, but anÂ enclosedÂ dedicated space could provide an opportunity to battle, level and trade alongside friends in a more dynamic environment than the traditional PokÃ©monÂ centre affair. So what do you think? Would you welcome any of these additions to the series, or do you think coreÂ PokÃ©mon RPGs are best left to handhelds? Do you have different suggestions for how a Wii U entry might be handled? Make your feelings known in the comments below.